A recent article on CBSLocal.com pronounced the burger at The Riders Club Cafe to be one of the best burgers in Los Angeles. I found this confusing, since San Clemente was in Orange County and about an hour's drive from LA. Still, a burger's a burger. It just so happened that Happy Meal and I were going to be in the area, and The Riders Club Cafe was only marginally out of our way. Parking was free in the attached lot of the 30-seat restaurant. The behind-the-counter staff numbered 6 on the Sunday afternoon that we visited. That amounted to a bunch of guys in a very tight work space. 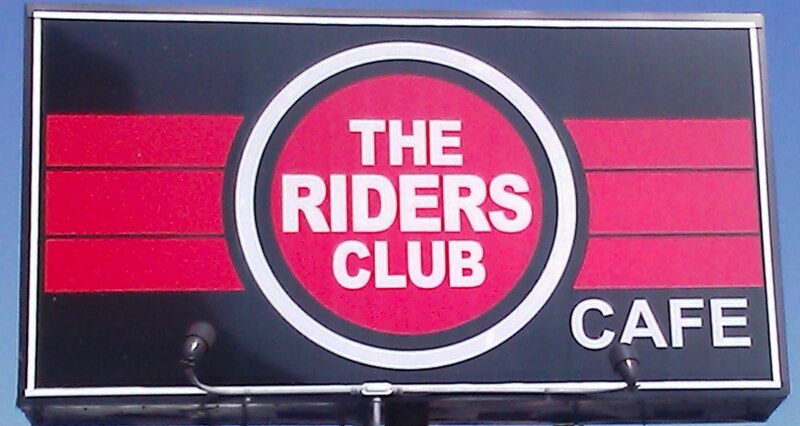 Business was good at The Riders Club Cafe. 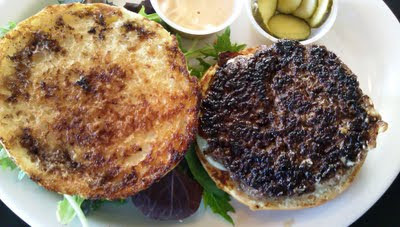 They also had earned the award for best burger in San Clemente for 2010. Happy Meal and I ordered the standard burger with cheese. The 5.5 ounce burger was priced at $7.95, and cheese was an extra buck. So, it was 9 bucks for a five and a half ounce cheeseburger. The burger arrived in about 8 minutes. The menu board promised chips, but those did not materialize, and that was fine. I didn't want a fistful of greasy chips. The Beef: The smallish patty was made of a coarsely ground Chuck. The 100% Angus Chuck was ground 2 or 3 times each day, and it was ground in-house. Interestingly, the Chuck was seasoned before grinding--a nice touch. The fat content was around 20%, and the beef was very juicy without being greasy. The burger meat had no notes of aging, iron, but it was beefy enough to be satisfying. The coarse grind created a satisfying mouth feel. The Seasoning: The pre-seasoned Chuck meant that the patty was lightly salted on the interior. The kitchen applied an ample amount of salt and pepper to the burger patty as it cooked, and this worked nicely to complement the interior savory note. The Sear: The sear was fantastic. The tag team of a hot flat top and broiler generated a thorough, even, and crunchy sear on the burger patty. That strong sear perfectly complemented the seasoning. The Preparation: The burger patties were formed in batches after grinding. The irregular, 5.5 ounce patties were loosely formed by hand. The burgers were first seared on a very hot and well-seasoned flat-top. They were finished under an adjustable, pull-out broiler. This system of cooking applied a perfect sear. While I did request Medium, my burger came out Medium-Well. Still, the sear was strong, and the slight over-cooking melted more of the collagen in the Chuck. The Cheese: I selected the Havarti from the 6 cheese choices. Sadly, the Havarti was meek. I was hoping for a funky, salty cheese, but that was not the case on this occasion. Still, the cheese was properly melted, and it did add some creaminess to the bite. The Bun: The bun was delivered by a local bakery, but there was talk of bringing in an oven and baking the buns in-house at The Riders Club Cafe. The fresh, moist bun was positively wispy in its character. It compressed with little resistance, and it was nearly invisible to the palate. It was a competent delivery vehicle, which contributed almost nothing in terms of texture or flavor. The bun was lightly toasted, but it brought no added crunch to the party. The Meat To Bun Ratio: This was good. The Toppings: The burger came with a mixed greens, which were fresh. It also came with a salty remoulade. This would have overwhelmed the burger, and I am glad that I ordered it on the side. The burger was also accompanied by a house-made ketchup. This was more like a watery marinara, and was delighted that I ordered that on the side. The Value: $8.95 for a small cheeseburger and no fries was a weak value. It was fortunate that Happy Meal came to split a burger for review purposes. I would have been very unhappy had I spend 20 bucks on a couple of smallish burgers. 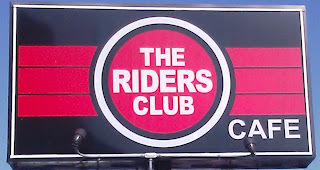 The burger was tasty at The Riders Club Cafe. It was also nicely prepared. Sadly, the toppings were relatively weak, and the value was not there. Burger Review : A beautifully seared burger but much too expensive cheeseburger at The Riders Club Cafe in San Clemente, CA.